On 28th May 2016 Bury St Edmunds' most iconic building launch will take place, as brick by brick St Edmundsbury Cathedral will be recreated from LEGO® bricks. Only four Cathedrals in UK have been interpreted in this way, this is the only build in the East of England. The target is to raise £200,000 (200,000 pieces of LEGO® ) to fund a youth outreach project to provide a lasting engagement legacy, for use by all the community. The LEGO® build will create volunteering opportunities for all to get involved, whether becoming a model builder yourself, to welcoming and encouraging the community to get involved with the Cathedral. 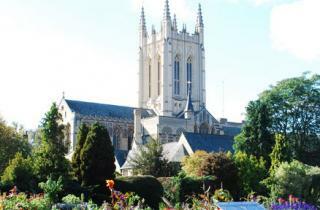 St Edmundsbury Cathedral has been a site of worship and pilgrimage for over 1,000 years. Today, Morning and Evening Prayer is still held in the Cathedral throughout the year, and thousands of people flock to Bury St Edmunds to take part in the special services, events, concerts, art exhibitions or to explore the amazing history of this historic building. The event will run between 10.30am and 3pm with the ribbon cutting and competition winner will be placing the first set of bricks at 12:30pm on the model. Official launch of our Cathedral build in Lego. Events around the Cathedral will include artist lead children’s sculpture making, LEGO ‘make a mini me’ workshop, LEGO trail, LEGO cake decorating, family trail, BBQ and much more!